After over 2 years of staring at the blank walls in our house, I finally took it upon myself one rainy afternoon last year to put up some type of decor – any type of decor – in a hysteric bout of nesting productivity that’s common among women whose husbands are deployed. Or at least it is with me. It started with a whole bunch of black picture frames I had sitting in a closet. I’d been collecting them over several months (okay years) when I found them on sale at places like Wal-Mart, Target, and even the occasional dollar store. I then grabbed some computer paper, scotch tape and scissors, poured myself a glass of vino, and popped Dirty Dancing into the DVD player. Nothing says spells productivity like a semi-co-dependent, Air Force hubs-missing, military spouse hopped up on chick flicks and cabernet. The key to creating your perfect wall photo gallery (without hammering millions of holes into your wall) is the use of templates. Now normally I wouldn’t condone any type of paper wastage (I work in the Environmental office of a certain rival branch of the military), so try to use pieces from your recycle bin for this part. 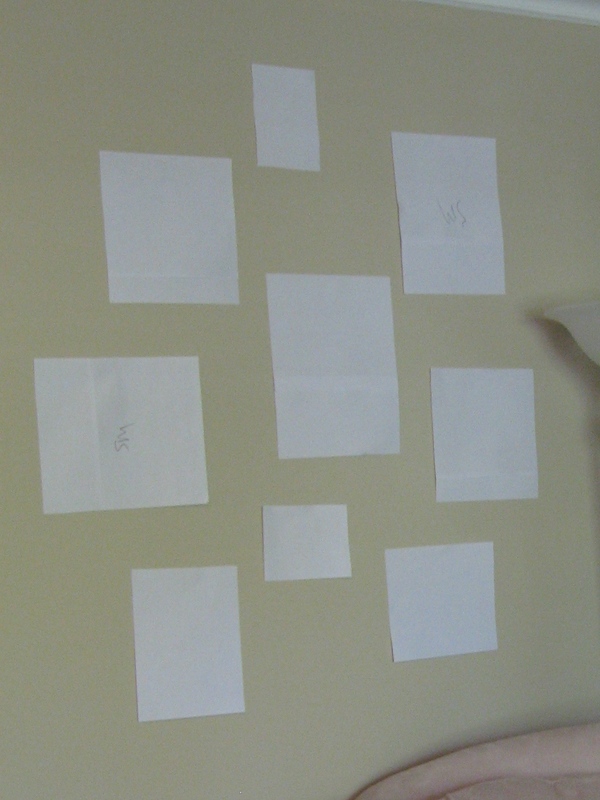 You should create templates using the paper, scissors and tape that match the sizes of the picture frames you might want to use. Then, once you’ve consumed a respectable-enough amount of your red blend to get the creative juices flowing, start taping ’em to the wall! Remember to vary your horizontal and vertical frames – if you have various horizontal and vertical photos you’d like to use. 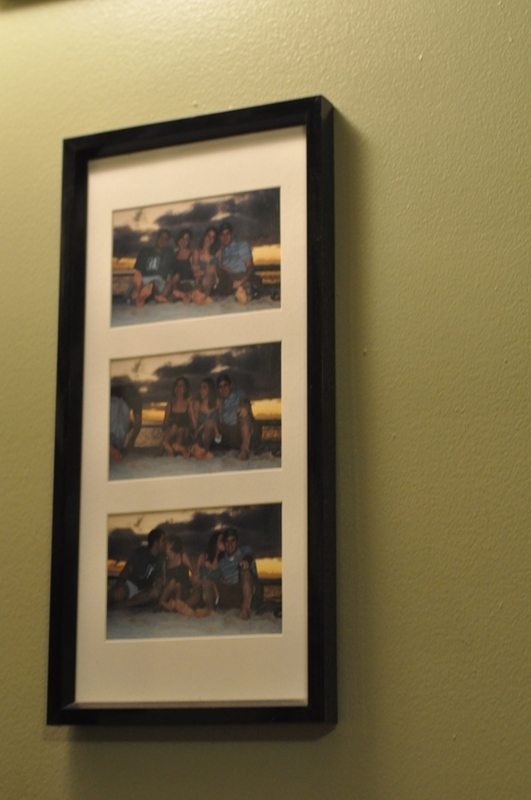 But if you’re strictly a horizontal photo-taker, then by all means, only hang the templates horizontally. If a specific frame can only be hung in a certain direction (check the hook options on the back of the frame), then make sure you mark that on the template. It may be helpful to choose and print your photos before this step if you’re very particular about which pictures you want to use or don’t have very many from which to choose. You don’t have to stick to just one wall! 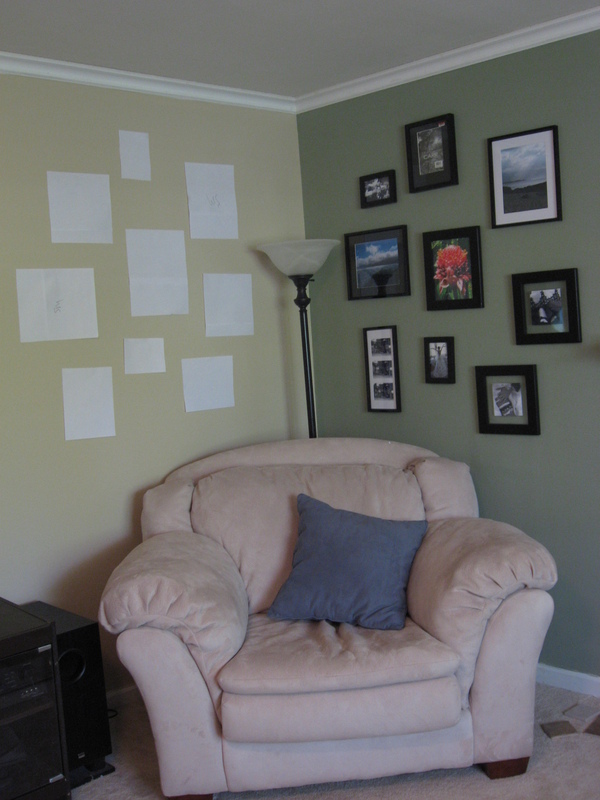 I created my gallery on two walls in a corner space to create a nice reading niche. 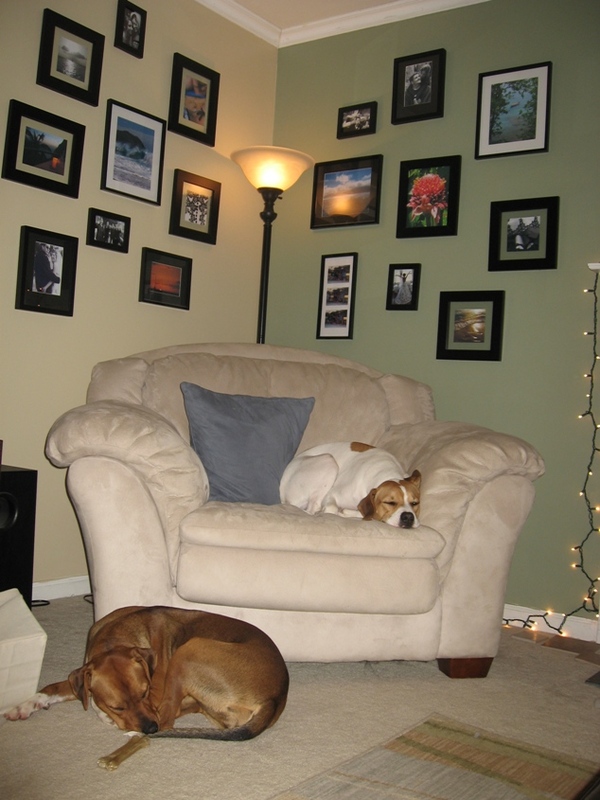 I also might have opted to hang two galleries – one on either side of the fireplace. Either way, try to hang all of your templates for a room before you start hanging the frames. Once you’re ready to start hanging, all you need to do is hammer nails directly through the top of each template (in the approximate location of the hanging hooks on the backs of the frames). 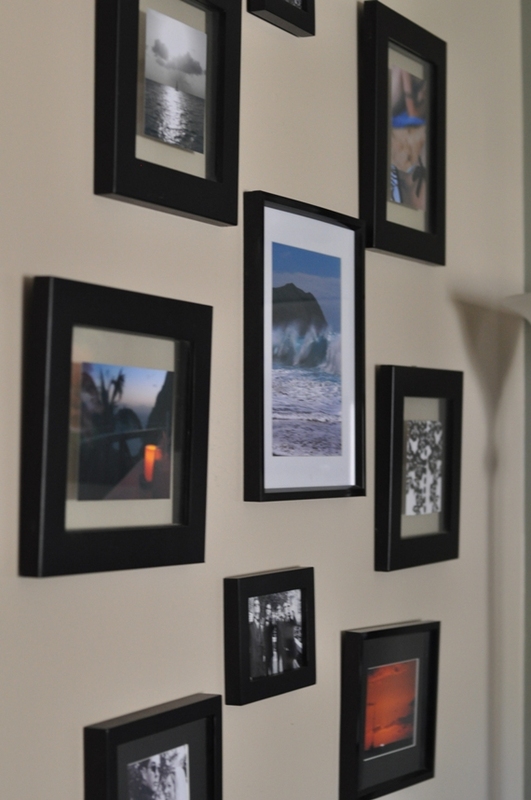 Once the nails (or picture hooks) are secure in the wall, simply rip off the templates and hang the frames! I opted for a mix of color and black-and-white photos, but an entire collage of black-and-white photos (or all color photos) can look incredible as well. You could also do a mixture of black and white frames, or all black, or all white. Pay attention to the color of the mattes as well. Some of mine had white mattes, others black, and some even had glass “mattes”. 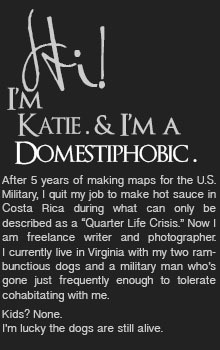 I had to make sure I spaced them out so I didn’t have all of my black frames with white mattes clustered in one place. In my euphoric I-miss-my-husband-so-I’m-going-to-spend-hours-going-through-wedding-and-vacation-pictures state of mind, I picked a mixture of… you guessed it… wedding and vacation pictures to print. And some others from our honeymoon in St. Lucia and our 2006 wedding. I was finished and ready to sit back and admire my handiwork – well before Baby was put in the corner – and I have to admit that my corner seemed much more appealing. Of course, I’m already contemplating changing all this around when we repaint the room later this summer, but that’s another story for another time. *I am aware that cabernet is not a necessity for hanging a photo collage. Hey, I’m just tellin’ you what worked for me. 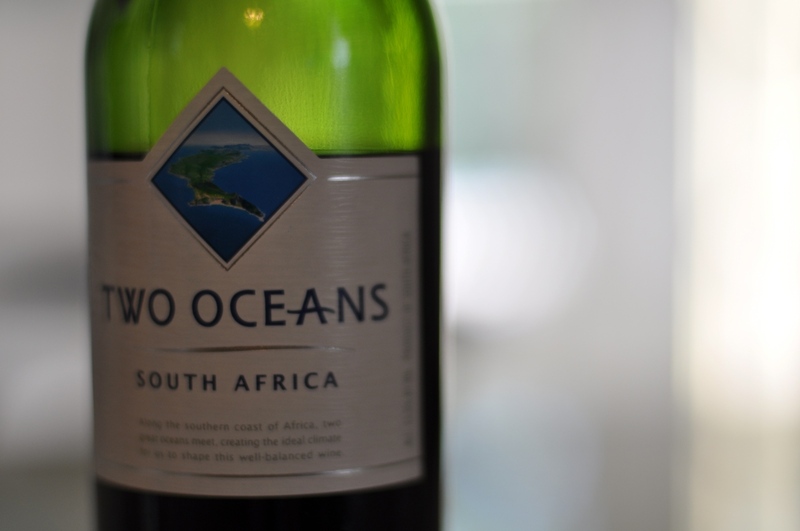 If you prefer a pino noir, then by all means, use that. Whatever floats your boat. Do you have any gallery-hanging tips to share?